My name is Mitchell Pasco and I started playing the saxophone almost three years ago because it is a fun instrument and it sounds great. 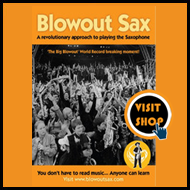 The Blowout approach is more enjoyable, beneficial and altogether, I think, a better way of learning the saxophone than traditional methods, and with no grades there is no added pressure and you can enjoy the instrument for what it really is. 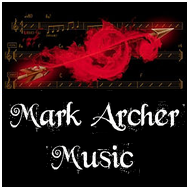 If I had to pick a favourite tune, it would be 'Mercy,Mercy,Mercy' as it is a simple tune with a large improvisation section meaning you can have a really great blow-out session and all together have a blast. My life was resigned to a life of listening to music rather than making music. That was until September 2008 when I made a conscious decision to do something about it, what instrument would I like to play? I have always liked the sound of the Saxophone so saxophone it is. I googled saxophone teachers in Bristol and came up with a number, thinking the worst. I braved the next sentence: 'I would like to learn to play the saxophone, I don’t have a saxophone and I can’t read music'. 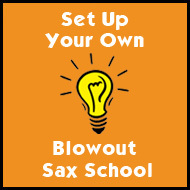 To my surprise that’s not a problem replied the voice on the other end of the phone, have you heard of blowout sax and gave me the rundown explaining that Blowout sax is being able to play music without necessarily being able to read music and I can hire a sax if I wish, I then booked my first lesson. My first lesson was amazing and by my second lesson two weeks later not only could I get a note out of my saxophone but I could play love me tender by heart, how amazing it that! It certainly wasn’t what I expected and me being me found instant results so encouraging, I wanted to be able to play the sax and that’s exactly what I got. Since then I have come on in leaps and bounds playing the sax first and learning to read music later. I have also changed from playing alto sax to tenor. My favourite piece of music is Summer time. My favourite teacher is the one and only Jackie greenwood.